I used to use Sing and See sporadically in the teaching of Mixed Belt to both Classical students and the Jazz students in workshops. The spectrogram shows clearly the shift of energy to the upper partials in Mixed Belt. It has also been very useful in language classes when working with vowels. Recently I have been been using the pitch trace frequently during one to one voice lessons. The biggest recent success has been an Honours Flute player who was not reaching the desired standard because of out of tune playing. I suggested she do her Minor Recital in Voice. I have used the pitch trace extensively with this girl, training her to hear the notes BEFORE she goes near the onset. This has been very successful with her singing, but most exciting was that she has just won the local Flute Eisteddfod against very good competition. I have set up a practice room with the program for the singers, but it is also beeing used extensively by the string players who want to see where their vibrato is actually sitting. Recently the Pohjois-Kymen musiikkiopistossa put on a workshop about using technology in music teaching. 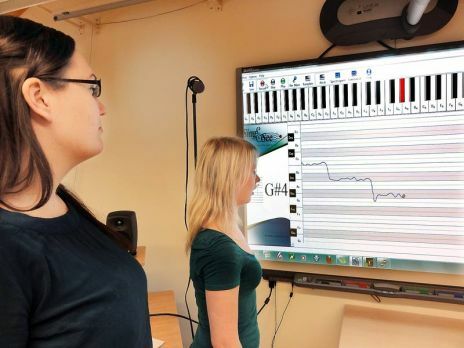 The College’s cello teacher Mikko Lehtola has been using Sing & See and demonstrated this to a group of singing teachers at a workshop on May 8th. He is leading a project – “LABRA – making instrumental studies more effecient through use of music technology” – which is funded by the Finnish ministry of education. Mikko Lehtola is also using Sing & See in teaching his cello students – and some other instrumentalists, violinists and flautists, are also finding it useful. Here is a photo from the news report of the event (English translation here) showing the use of Sing & See on a large smart display. “Laulun ja soiton opiskelu on siirtynyt nykyaikaan, julistaa pilke silmäkulmassaan Emilia Vesalainen. Pohjois-Kymen musiikkiopistossa laulua opettava Vesalainen on yhdessä kollegansa Anne Korpelaisen kanssa innoissaan Labra-hankkeesta, joka tekee tietotekniikasta työkalun musiikkiopintoihin. Elokuussa alkaneen hankkeen ideoija ja vetäjä on opiston sellon soiton lehtori Mikko Lehtola, jonka mukaan musiikkiteknologia selvästi kiinnostaa nuoria — enemmän kuin aikuisia. Tällä hetkellä musiikkiopintojaan tehostaa tietotekniikalla noin 10 Mikko Lehtolan sello-oppilasta. Lisäksi joukkoon kuuluu muun muassa viulisteja, huilisteja ja klarinetisteja.